See how many you can name? Don't have a year but think it was the early 80s. that will do the now. Struggling with the female faces!! What a great photo - thanks for posting - loving the beards and the clothes and the whole late 70s early 80s vibe! A blast from the past .... I thought they were really old then .....but they werent some of the female teachers were Morag Martin and Alison Millar (PE), Mrs McPherson (Language) a lady we called [Miss McGougan - Maths] but im not sure if she was Miss McPhail or not .Mr Simson (tech) behind Mr McGilvary (tech), near them was [Alan McLay] . Last edited by Mod8 on Wed Dec 21, 2011 2:50 pm, edited 2 times in total. Can we please try and avoid nicknames - some of which were not necessarily the kindest. Many in the photo are sadly no longer with us. Brings back many memories - they don't make teachers like that any more. A few more names: Miss Hamilton, Miss Docherty and Mrs. McAndrew (all English), Mr Bissett and Dr. Milne (physics), Mr and Mrs Dargie. Ok, here goes, back row from left Page, Bissett, Meyrick, McPherson, Duncan, Henderson, Milne, Lennox, Evans, Kilpatrick, Purdie. 2nd Back Row Harrow, Finnie, Stevenson, McKerral, Scott, Stankey, Simpson, McCallum, Dargie?, Milligan, Elliott, Lennox Stewart. Third Back Row Young, Ward, McEwan, Davidson, Leys, Kerr, Urqhart, McGillvray, McPherson, Togneri, McLay, Smith, Mc millan, McAndrew, Miller, Martin. Front Row Fergusson, McBrayne, ?, Gemmel, Horseman?, McIntyre, ?,?, Donachy. The one I thought was Mrs Horseman is Miss McGougan and to the left of Mrs McIntyre is Mrs Kerr. Think it would be 1980 Dave, thats the year I started, Mr Dargie had left by that time but he was there when the primary 7s had their visiting day before end of term. I met his sister by chance in 1987, she was working in a library in the outskirts of Vancouver, there ye are now!!!!! Miss Hamilton, front row, next to Miss Donachy, next along (I think) is Mrs Dargie. 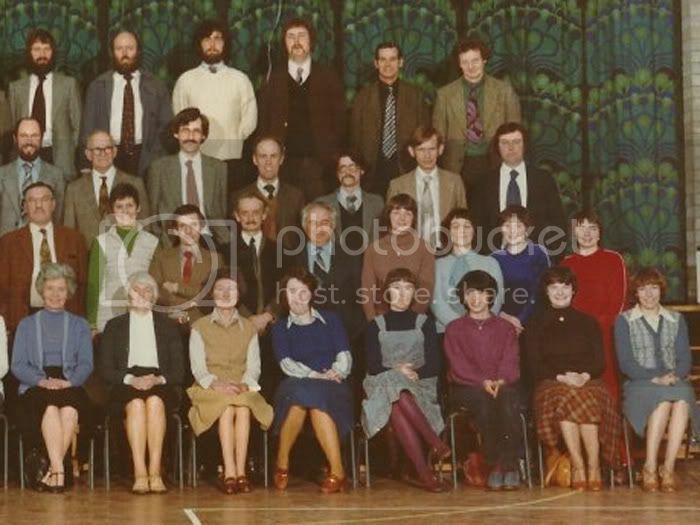 Two to the right of Mrs McTaggart is Miss Woodrow then Catherine Dobbie I think. 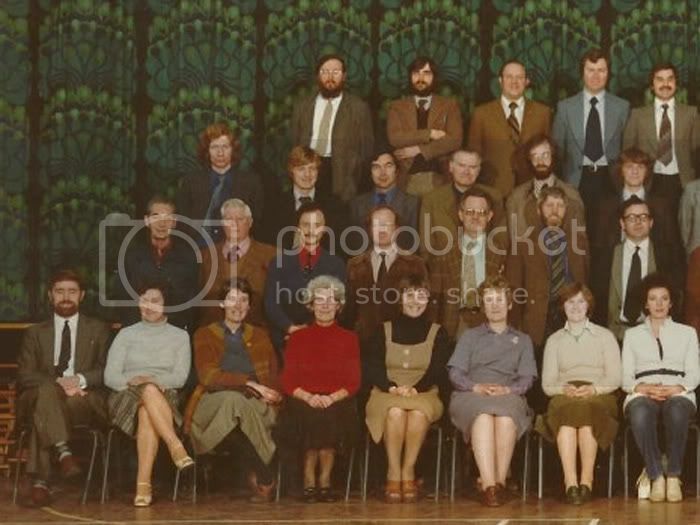 Am I right in thinking that Mr. Harrow is the only teacher pictured still working at Campbeltown Grammar? As someone pointed out earlier, it's a shame several others are no longer with us. Perhaps we should be doing a "where are they now?" on some of the other teachers here.